"Make no mistake about it - enlightenment is a destructive process. It has nothing to do with becoming better or being happier. 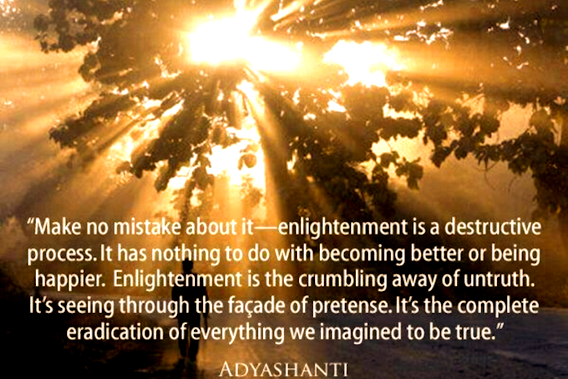 Enlightenment is the crumbling away of untruth. It's seeing through the facade of pretense. It's the complete eradication of everything we imagined to be true." When possessed by a sadness, an anxiety, a hatred, or a passion or whatever, the method of pure observation and recognition may seem difficult to practice. If so, turn to meditation on a fixed object, using your own state of mind as meditation’s subject. Such meditation reveals and heals. The sadness or anxiety, hatred or passion, under the gaze of concentration and meditation reveals its own nature—a revelation that leads naturally to healing and emancipation. The sadness (or whatever has caused the pain) can be used as a means of liberation from torment and suffering, like using a thorn to remove a thorn. We should treat our anxiety, our pain, our hatred and passion gently, respectfully, not resisting it, but living with it, making peace with it, penetrating into its nature by meditation on interdependence. 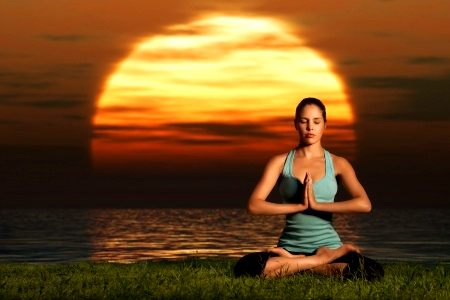 One quickly learns how to select subjects of meditation that fit the situation. Subjects of meditation—like interdependence, compassion, self, emptiness, non-attachment—all these belong to the categories of meditation which have the power to reveal and to heal.